Memphis Grizzlies: Will Mike Conley Ever Be An All-Star? There are players who get snubbed from making the All-Star team year after year and Memphis Grizzlies guard Mike Conley always seems to be one of them; will things ever change? 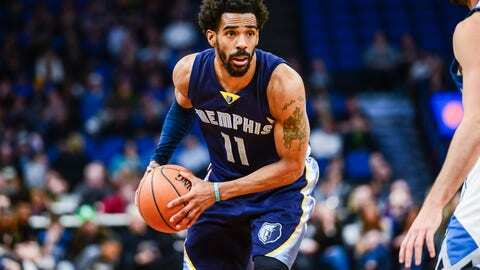 Memphis Grizzlies star Mike Conley once again finds himself not being named to the NBA All-Star team. He will not be participating in any events. He’ll be one of the many players at home or watching from the crowd. Mike Conley has been snubbed multiple times. As the years go by, he’s watched his teammates Marc Gasol and Zach Randolph get in but not him. This year, Conley is averaging a career-high 19 points per game and shooting a career-high 41 percent from deep. It’s a shame that he’s having his best season and still got snubbed. The Memphis Grizzlies has been winning for years now and that usually plays a part in whether good players make it or not. In Conley’s case, he hasn’t been so lucky. The issue for Mike Conley is that he plays point guard, possibly the NBA’s most talented position. More than half of the starting point guards in the NBA are capable of making an All-Star team. As a result of playing in the Western Conference, Conley has to compete with guys like Westbrook, Steph Curry, Lillard, and Chris Paul. Let’s not forget that James Harden is playing point guard this year, and is arguably the best at that position. Even if Mike Conley played in the Eastern Conference it’d still be a tough task to make the All-Star team. He’d have to go up against Kyrie Irving, John Wall, Isaiah Thomas, Kyle Lowry and more. One thing you can fault him for is his numbers. They can be better but you can say that about almost anyone. Conley’s averages have never stood out to the point where you can truly say “Ok that guy will definitely be an All-Star this year”. Does Mike Conley have what it takes to average 25 points? Does he have what it takes to average 10 assists? He’s never averaged a double-double and never averaged at least 20 points or 10 assists separately. Even so, his numbers throughout the years are still All-Star worthy. If Conley continues to get snubbed then those conversations of greatest players to never make an All-Star team will continue to circulate around his name. He’d be joining players like Mike Bibby, Monta Ellis, Rudy Gay, and so on. It’s doubtful that he’d want to be on these type of lists. So will Mike Conley ever make an All-Star team? What do you think?